Cold front! Will this winter never end? A big pot of warm stew would hit the spot — or we could throw up our hands, succumb to nature and eat cold stuff. Stuff on ice. Oysters, say. Except Mrs. Me doesn’t like oysters, and Tom Sietsema didn’t like the oysters at Catch 15. So…just icy cold drinks then? Catch 15 is a hip new restaurant/bar on K Street (1518 K). Smoky lighting, with lots of dark woods and fabrics, and screens showing video of fish and octopi, the place makes you feel underwater, kind of. It’s actually quite warm and cozy inside, so that’s nice (until we get to summer). We stopped by for a drink one night last week on our way to dinner at Equinox, more about which soon. Catch 15’s dining room was only half full at 6pm but the bar was getting packed — fortunately we got a couple of the last available seats before the real crowd hit. It probably didn’t help that Sietsema’s WaPo review, originally published in late February, was re-published in the Express just a day before we visited. Happy hour specials are few but good; I liked the “ultimat mule” — a perfect balance of vodka, fresh lime juice, and ginger beer. All the HH drinks are $5, a fine value, including enormous pours of Lindemans cabernet sauvignon. The bartender was excellent: efficient, friendly and good at making drinks. Food specials were tempting — the truffle fries looked good — but needed to save room for dinner. The guys sitting at the oyster bar in the front of the house looked happy, but maybe that was on account of the expansive elbow room and lack of noise compared with the bar area, rather than on account of the oysters. Or maybe the oysters are actually good? Anyway, I’d go back for more drinks and to try some food, but not on a Friday. It was very very very very very VERY loud. Butter is up there with bacon in terms of making almost everything better, but newish Freddy’s Lobster + Clams (4867 Cordell, Bethesda) provides an exception. We went for dinner recently and mostly liked the food: crisp thick batter on the fried fish, tasty though limp thin-cut fries, and an excellent classic lobster roll. Freddy’s offers two lobster rolls: cold with mayo, i.e the excellent aforementioned “classic,” or warm with butter, i.e. tasty but soggy and too buttery. Turns out even butter has its limits. It wasn’t my order but I had the last bite, and the bun was so saturated I think there was more butter than bread. There wasn’t any lobster in my bite, because it had all been eaten before I was allowed a taste. I’m told the lobster was delicious. I ordered the fried whole belly clams, which were suitably briny, maybe a little too chewy, certainly well-fried. One clam had a bonus prize inside: shards of clamshell. Is that a feature or a bug? I guess it means they were real, but I could have done without the shell. I liked the broth-not-milk-based Rhode Island style clam chowder, despite having ordered the “home style” (creamy); when the wrong bowl arrived I asked for clarification but they were pretty confident it was what I had ordered. It wasn’t, but I took it as a sign, and it ended up being good enough that I didn’t mind. But it was also just one of several signs we encountered of servers that could use more training, I think. Pretty raw crew there, it seemed. The beer selection at Freddy’s is also quite good, about eight choices on tap plus a couple dozen or more bottles. But, Brickskeller-like, they were out of the first two beers I tried to order (one draft one bottled). Third time was the charm, some not-memorable IPA, but I didn’t like being taunted with Bear Republic Racer 5 on the menu and then not getting to drink any. Butterbeer is not on the menu, but should be. Missing some cross-promotion opportunities there! I could have made my own, I suppose, by squeezing the warm lobster roll into my glass, but I think those might be two great tastes that don’t taste great together. I will not be researching that combo in the future. Chef Tony’s (4926 St. Elmo, Bethesda) has been open nearly four years (says the informative if cluttered website), but we discovered it only recently, and it is really a hidden gem. If you can be “hidden” right in the middle of St. Elmo Avenue, that is. A Mediterranean joint with a seafood focus, Tony’s is (like many restaurants these days) all about fresh, local ingredients, but unlike some, they seem to be serious about it. For example, they make their own buffalo mozzarella, and it is super-creamy, fresh, fantastic. The calamari (not local?) is also fresh and perfectly cooked, even creamy-textured (to a lesser degree than the mozza), not at all rubbery, and expertly fried, though still a bit greasy for Mrs. Me’s taste (I loved every last crumb). Plus they give you the tentacles (the best part), not just rings like some places do. We also enjoyed the crab pasta, lots of fresh crabmeat and perfect al dente pasta — pretty sure the pasta was from a box, not fresh-made, but that’s about the only thing that wasn’t clearly fresh. Pan-seared sole in parmesan crust over mashed potatoes with big salty capers was also a winner. Nearly everything was delicious, down to the large cannoli we ended with. We also got a square of cheesecake to go, and that was the only item we didn’t think was great — texture was fine, but flavors were off; it was supposed to be a melange of a couple of fruits, but didn’t work for our tastebuds. Service was friendly but we encountered some odd delays. They didn’t seem understaffed — multitudes of black-clad staff were constantly zipping all over the floor — but maybe they were. The space is a little awkward, with essentially two separate rooms, one in front and one in back, separated by a bar with a narrow passage. Even though the timing was sometimes off, it didn’t affect our food, which arrived hot and fresh. The only other drawback was the temperature, which was authentically Mediterranean-in-August; the calamari in the fryer wasn’t too many degrees higher than us at our table. Ceiling fans were rotating full steam but either the air conditioning was broken, or maybe there isn’t any, or maybe they’re just trying to save a little money; in any case, by the end of the meal, I was sweating, not a vindaloo kind of sweat, but a hot-restaurant-with-insufficient-AC sweat. Kind of unpleasant. The food was fab, and we will for sure be visiting Chef Tony’s with more frequency, but not until the weather cools down (so, maybe late October?). The Twisted Tarpon (678 75th Ave.), until late 2010 called Philthy Phil’s, across the street from the Sloppy Pelican…you get the idea. Beach shack dive with fried stuff (though surprisingly few seafood options), a mix of locals (but not those who complain about the noise) and tourists (only some of whom are fried), and surprisingly good food and service. $3 margaritas: winners, despite plenty of sour mix. Crab nachos are a good spin on the traditional, with lots of crab (real, not surimi), green onions, gloopy white American cheese, fresh-ish chips, it all sort of works. Asian salad with grilled tuna was good, and while the “fish bucket” wasn’t the best fried fish I’ve ever had, it was decent, and at $7.95 was the best deal we ate all week. Busted for selling crabs without a license. Might sound silly, but crabbing is a serious business on the Maryland shore, and I take my crab-eating seriously as well, so I say throw the book at ’em. But the arrests got me thinking, and poking around the internets, and I’m amazed at the sheer volume of crab statutes and regulations that exist. 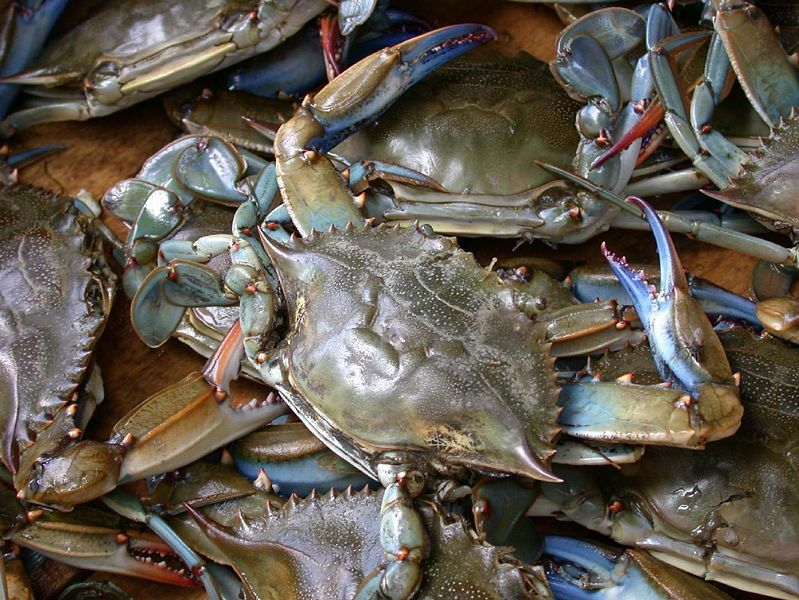 I don’t think I can link directly to the Maryland Natural Resources Code (it is online), but Title 4 (Fish and Fisheries), Subtitle 8 (Crabs) goes on for sixteen sections (some have been repealed) of prohibitions, rules, limitations, seasons. § 4-815 says simply “In St. Mary’s County, a person may not harvest crabs with a bank trap or a channel pound after October 1, 2000.” And thank goodness for that. That’s just the statutes. The blue crab regulations go into much more amazing specificity, like how licensed crabbers may remove crabs from trotlines (as opposed to scrapes, pots, traps, channel pounds, net rings, handlines, dip nets or pound nets) “Between sunrise and 10 hours after sunrise during April, October, November, and December” (08.02.03.11(A)(1)(a)(ii)). These historical tables of blue crab laws (as opposed to Blue Laws, about which see Maryland Business Regulation Code Title 18) are also cool. For some reason this stuff fascinates me, and makes me hungry. But I’m hungry for Dungeness, not blue, which are too much trouble. 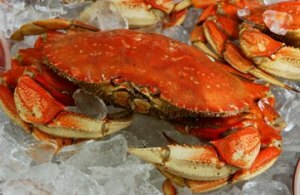 Washington State’s crab rules are even more voluminous than Maryland’s, and more fun too — there’s even a quiz! Costco usually carries Dungeness, and the only way to stop thinking about them is to go buy and eat some. There are worse ways to spend the coming weekend (like, sitting in jail, trying to explain to your large, skeptically-mean-tempered cell-mate exactly of which crab-selling statutes you allegedly fished afoul). As we got back in our car again yesterday someone said “it’s hot enough to poach an egg in here” and I felt pretty well poached myself after the doors shut and before the a/c made a dent in the heat. Still, I guess I would choose this over being snowed in for a week. We figured since it was hot like hell anyway we may as well visit the Commonwealth, including a successful visit to Eamonn’s Dublin Chipper (728 King Street, Alexandria), run by the Restaurant Eve folks whose rave local and national press for Eamonn’s/Eve/PX you have surely read many times in recent years. Eamonn’s was as good as expected, amazing crisp coating on the fish — we tried cod and grouper and couldn’t detect too much difference, cod a bit fatter but similar taste and texture, all good. Fries (real potatoes) also excellent, fatter and crisper than, say, Five Guys. Our only issue was figuring out how much to order for four people: we ended up with not enough fish and too many fries. It depends how hungry people are of course, but on future visits — and I hope there are some — I want a regular (i.e. largest possible size) order of cod for myself, maybe more, and will be happy to share a single order of chips. Also need to try some sides — mushy peas! — and perhaps the batter burger, which I think is fried? Can’t go wrong with fried, these guys know what they’re doing. Oh, the sauces — Eamonn’s is big into dipping sauces, they offer seven; we tried regular ol’ tartar sauce (fine), Kitty O’Shea (I think? – very olive-y, others loved it but I didn’t), hot chili (not too hot, fine), and curry, which snuck up on me, not heatwise — it’s mild — but qualitatively, as it didn’t seem all that at first but then I realized I had eaten it all. It’s really all for the fries, because the fish needs no sauce. They serve beer, including of course Guiness, but we didn’t have any (early lunch). Next time..